Italian Far Right's Salvini Under Fire After Black Athlete Hurt in Attack (NYTimes). At the same time, he dismissed concerns over racist attacks in Italy, saying migrants were to blame for a third of all crimes in the country. "This is the only true drama," he said. "I remember that the crimes committed every day in Italy by immigrants – he adds – are about 700, almost a third of the total, and this is the only real real alarm against which I am fighting as a minister". "Ricordo che i reati commessi ogni giorno in Italia da immigrati sono circa 700, quasi un terzo del totale, e questo è l'unico vero allarme reale contro cui da ministro sto combattendo"
Are a third of the crimes in Italy committed by (possibly non-EU) migrants? No part of Matteo Salvini's claim is true. 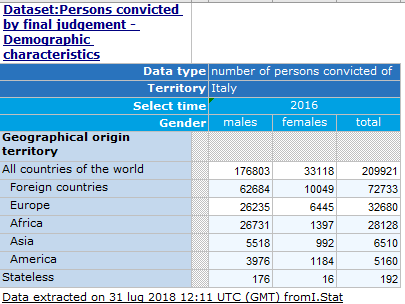 When looking at data from the Italian National Institute of Statistics(Istat), neither the 'one third' or '700' claim make any sense in regards to the number of crimes committed. Unless Salvini provides the source of those numbers, it's pretty safe to say either he or his source made them up. However, roughly one third of total people convicted in Italy did have a 'foreign origin'. The claim is still wrong as not every foreigner in Italy is an immigrant, but it may be the reasoning behind Salvini's claim. Therefore, in order for Salvini's '700' number to be correct either total crime dropped 70% since 2016, or the number of solved crimes has risen 50% since 2016. Neither of those are realistic, so the '700' part of the claim is likely just completely made up. As you can see, roughly a third of the 200,000 total convicted criminals were from somewhere other than Italy. However, it is misleading to say they are immigrants, as this stat includes every foreigner in Italy: immigrants, tourists, migrant workers, refugees, travelers passing through Italy, etc. Because of this, it is safe to say that the percentage of criminals who are immigrants is some large amount less than one third(and far below 700 per day). In short, until we know where Salvini is getting his data we can say the claim is completely false. Saying that 700 crimes/a third of the total are committed by immigrants daily makes absolutely no sense, as the total number of crimes is much too high and the number of crimes with known offenders is too low. Saying that a third of all criminals in Italy are immigrants is slightly less wrong, though it is still not true. Not the answer you're looking for? Browse other questions tagged criminology immigration italy . Do cyber crimes cost $US114b annually? Does the 'Mafia' still exist in Italy? Do a third of Italian men live with their parents?